If you’ve been reading Needle ‘n Thread for a while, you might recall a couple years ago, I highlighted the pearl and goldwork embroidered frames by Larissa Borodich, a reader in Russia. Larissa’s needlework is beautiful, so if you haven’t seen her gorgeous frames, you might jump back to that article and take a quick look! I love hearing from Larissa and seeing what she is up to – she never fails to amaze me! If you use Pinterest, she has some lovely boards on Embroidery. While you’re there, check out all her antique ecclesiastical pieces from her own collections – absolutely gorgeous stuff! Larissa recently sent me some photos of some embroidery done by her friend Elena Emelina, and of course, I had to seek permission to share! One aspect that really caught my attention was Lena’s ingenious use of pearl purl in her metal embroidery. Lena’s work is vivacious and captivating! I thought you might enjoy seeing it, too. I’ve never seen pearl purl used this way, and I think it’s ingenious! Beautiful, isn’t it? 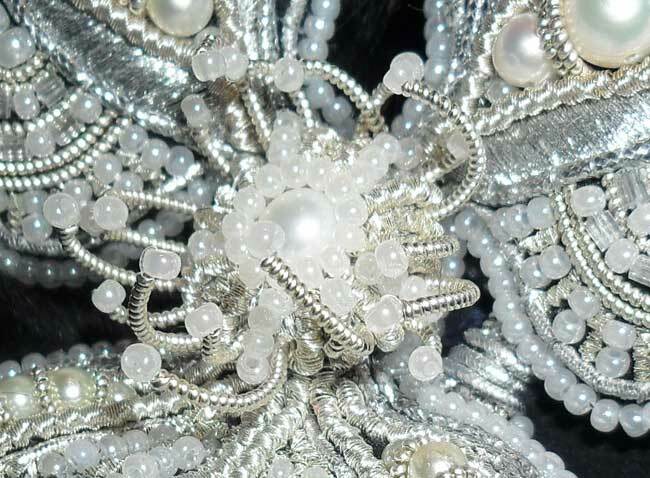 I love the swishy tails, and the combination of the silver and pearls. Here’s another one of Lena’s masterpieces. I think it’s striking! Her brooches are miniature embroidered sculptures, really. And speaking of striking! 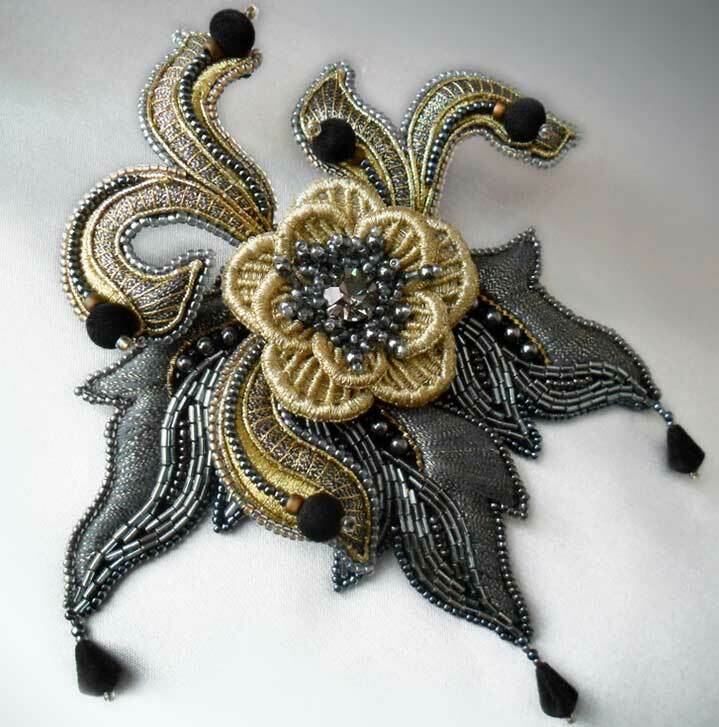 The shading in the beadwork, the pearls and metal threads on the black background, the minimal use of very vibrant color – it all works together so well! Lena has been sewing for many years, but her favorite part of sewing is embellishing the clothes. She’s taken to embroidery with a passion – and she’s completely self-taught. I can’t wait to see what else she does in the years to come! 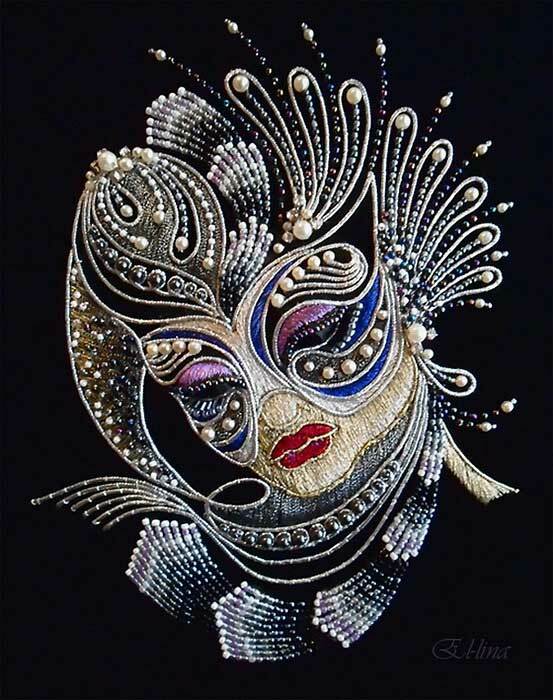 Isn’t incredible what people can do with needle and thread? I’m always amazed, always amazed…. Just stunning! There are so many talented people out there that we would probably never know about. Thanks for sharing with us Mary. 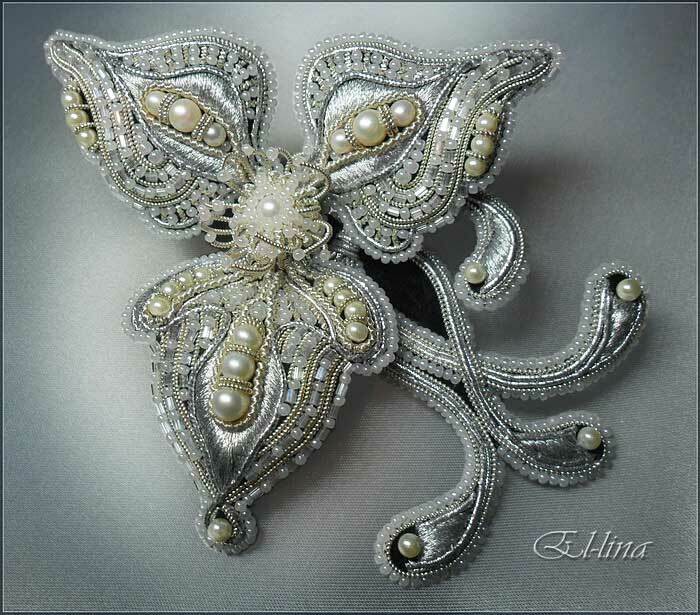 The purl as soutache – very clever. I really like the appliques very much. Sometimes I find a few elaborate ones on old clothing at yard sales. But these are couture level. Very pretty pieces. This is an amazing work ! I am admiring her talent. Thank you for sharing Elena’s work with use, it is absolutely stunning! OMGosh, what amazing works of art! Funny – the first time i heard of metal purl was where someone used it in jewelry to cover the thread where it shows at the ends of a necklace. I love the asymmetricality of her designs. I want to thank you for the review of “Russian Elegance” which I purchased immediately. I was amazed that such a book was only $23 from Amazon-and what a book! Now the link to Larissa’s Pinterest boards. I’m in heaven. I have been a student of Russian history and culture for years. They have a sensibility for beauty that’s incredible. I started a kokoshinik ( a very simple one) a while back and hit a wall. Now I want to get back to it but have to wait for all this inspiration to gel. Thank you and Larissa! Mary, those brooches are ABSOLUTELY AMAZING! Thank you so much for sharing such inspiring work. Absolutely brilliant. I would never have known about pearl embroidery or the fabulous artwork and jewellery being done in Russia today without your website, Mary. So inspiring. Thank you so much for sharing Lena’s work! You are very open and generous to people! I am amazed with Lena’s work and also look forward to seeing more of her beautiful things. Mary, wow! Thanks for sharing this. I can’t express the swarm of creative ideas this post has inspired! Lena’s work is amazing. Simply Wonderful. I have no words to explain Mary. You are really a talented artist.